One of my Facebook friends who shares my love for New Orleans and its culinary pleasures posted the picture below the other day. He generously agreed to share his recipe. 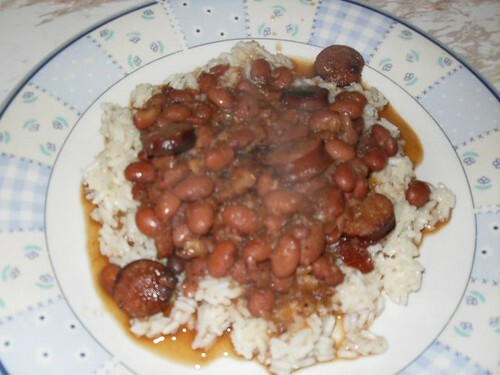 Red beans and rice is traditionally served on Mondays in New Orleans. Monday was “wash day”, a very busy day for homemakers, so an easy meal that could simmer all day on the back of the stove made sense. Despite the fact women no longer spend all day Monday scrubbing clothes, red beans and rice remains a traditional favorite. Salt, pepper and Creole seasoning to taste. Combine the beans, water, stock, ham and bones, onion, garlic, and bay leaves in a crock pot. Then add the salt, pepper, Tabasco and Creole seasoning but not too heavy at first. You need to let the beans cook for awhile and taste to re-season as needed. Always re-season all during the cooking process to help build the level of desired taste. Never wait till the end to season because it is too late by that point. Start the crock pot on high to get it going and then reduce the heat to low and let simmer on low heat for about 8-10 hours. When the beans are soft enough, mash some of them against the side of the pot to help release some of the starch, which makes a really nice sauce. Add your smoked sausage that has been browned to the pot when you have about 3-4 hours cooking time left. Serve over a bed of white rice. Note: Always brown the smoked sausages before adding them to the beans. You may need to add some water or stock to the beans during the cooking process if you find the beans becoming too dry and need more moisture. I prefer stock over water because it adds to the richness of the beans. Also, soaking the beans overnight helps in the cooking process. Doug Young lives in Hickory, N.C. but hopes to one day soon become a resident of New Orleans. He loves to cook all kinds of food but has a passion for anything that is Creole and Cajun. He loves anything associated with his favorite city in the world – New Orleans. He likes sports, the Saints, Lakers and Yankees. He is a proud member of the Mardi Gras Krewe of Okeanos and the marching club, KOE and he currently works as an Elections Specialist for the Burke County Board of Elections. Thank you, Doug, for sharing this delicious recipe. Perhaps one of these days we will both be living in New Orleans and you can invite me over on a Monday for red beans and rice. *Dee’s recipe note: Doug didn’t specify the brand of Creole seasoning but I added the links to my personal favorite, Tony Chachere’s. Also, if you have access to Zatarain’s rice, that’s my preference for white rice.